New this SPRING! Delicious fresh Fraser Valley Strawberries marry with the deep dark robust sunkissed figs, and then in big copper kettles, we slowly simmer the flavors together to produce a thick, rich, balsamic reduction that is a delight on summer salads, roasted vegetables, marinades, drizzled on fresh strawberries, or for grilled peaches this summer on the BBQ. Slowly simmered to a dark and mellow thickness these reductions are our latest creation from the edible gardens kitchen. Classic is dark and sweet with just a hint of fig. Fig & Fire is smooth and rich using the Habanero peppers for a sweet heat that is irresistible. Espresso is made from dark rich Espresso Beans from Italy. Pumpkin Chai tastes like Pumpkin Spice made from exotic spices like cardamom, cinnamon, cloves, nutmeg, ginger. beautifully red with real pomegranate juice this is a treat on goat cheese, with feta on spinach and cool cucumbers. New this SPRING! Delicious fresh Fraser Valley Strawberries marry with sun kissed deep dark robust figs. 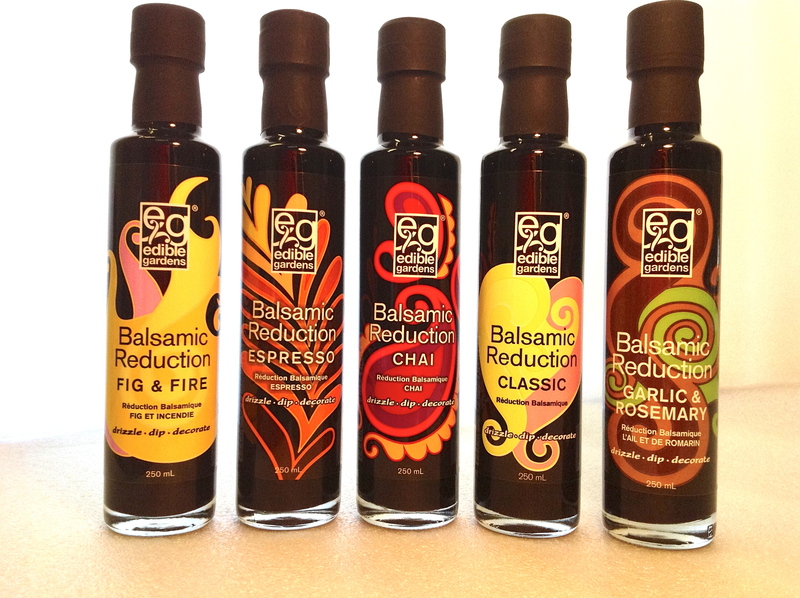 Our Balsamic reductions will add sweet savory tones to your favorite foods. Proudly GLUTEN FREE these 6 sisters to the edible garden family have been well received by our customers who love the 6 very different flavours. Starting with aged 100% balsamic vinegar from Modena Italy, our reductions are a labour of love using time and slow heat to marry the balsamic with sun kissed fruits and herbs. Simply sensational right out of the bottle, as a glaze or marinade, edible gardens Balsamic Reductions are fun and flavorful and wildly successful! It is our pleasure to simmer the balsamic into these jewels for you to enjoy! anywhere is hawaii sells this product? love the fig and fire! hi there, I have the Classic reduction and wondering if it has to be stored in the refridgerator after opening? Hello! I am interested in ordering online and having shipped to me (WA state). Can you provide prices and let me know how I order from you? Thank you! i am in love with the garlic and rosemary and would like to order a case, how do I go about that? Hi. Visited my daughter in Portland and tried Fig and Fire and it was amazing!!!! How can I order a bottle or 2. I live in Cleveland Ohio. Is there anywhere to buy your products online? I bought a bottle at a cheese shop in B.C. but don’t want to have to drive all the way back to the cheese shop. I am in Hope, B.C. Hi Shelley, Thanks for loving our products and finding them at artisan stores throughout BC. We ship all over North America, so we can easily ship some balsamic your way. Please find a detailed email in your inbox, with more info on how to get edible gardens delivered right to your door.